I love Shakespeare, and I especially love when directors set his plays in different time periods, because I think that more modern settings help today’s audiences relate more to the material rather than dismissing it as “boring old Shakespeare”. While I’ve always contended that people who insist that Shakespeare is boring because of reading the plays in school must have had the wrong teacher, and that traditional settings of the plays can also be wonderful (such as SFSTL’s outstanding Hamlet two years ago), I think that non-traditional settings can bring a new freshness and vitality to the works for contemporary audiences, and this production of Othello, set in 1912, is an excellent example. Othello is a Moorish general and war hero who loves and marries the Venetian Desdemona. Iago is a junior officer who hates Othello. Othello is happy, and Iago hates that, and so Iago sets about trying to destroy Othello’s happiness by playing on his jealousy. It’s the classic tragedy that deals with timeless issues of honesty, trust, insecurity and racial and class prejudices. Shakespeare Festival St. Louis brings it to life in an intense, haunting production. 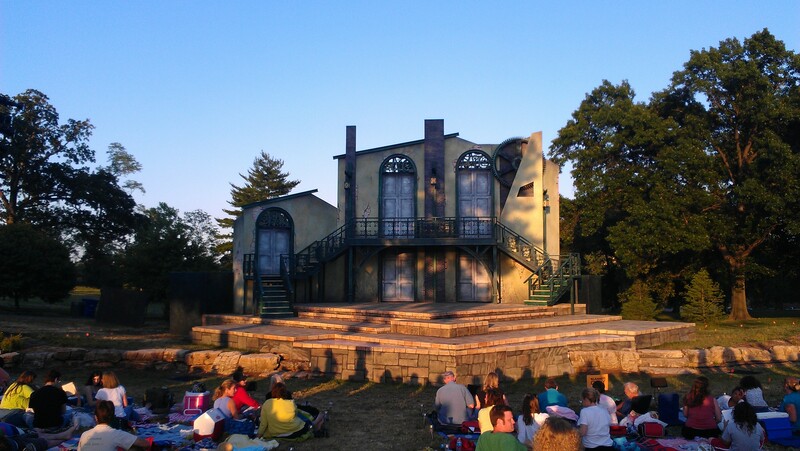 The outdoor setting in Shakespeare Glen is perfect for setting the mood, as is the haunting music especially of Desdemona’s “Willow Song” in the second half. The period-accurate costumes and vaguely steampunk-inspired set with lots of gears everywhere to suggest a giant early 20th Century machine also add to the mood. The lighting effects, often reflecting the mood of the characters (green for jealousy, red for anger) provide a powerful complement to the drama as well. I particularly enjoyed the post-battle scenes that suggested old WWI era movies, with soldiers in khakis and Cassio with his pith helmet and goggles. Other touches like an authentic-looking Victrola in Othello’s and Desdemona’s bedroom lend to the period atmosphere. As for the performances, Justin Blanchard is a commanding, convincing Iago. Much is said of the scheming villain’s “honesty” and Blanchard does an excellent job of making his duplicity seem convincing. He is obviously not honest, but he believably convinces his victims of his trustworthiness. His single-minded determination to destroy Othello (Billy Eugene Jones) is thoroughly believable, and he ably shifts from wheedling and placating with Othello to downright menacing with his wife Emilia (Kim Stauffer). The scene in which he finally convinces Othello of Desdemona’s “infidelity” is especially powerful, well-acted by both Blanchard and Jones. Jones is compelling as Othello, ably displaying an honorable general’s descent into the darkness of his own suspicions. His later scenes with Desdemona (the also excellent Heather Wood) are intense and heartbreaking. Other standouts in the cast are Stauffer as the longsuffering Emilia and Joshua Thomas as Cassio, the military officer who is caught in the middle of Iago’s plans. The entire ensemble is excellent and they work together extremely well. Some of the later scenes can be challenging for modern audiences, as the women are constantly mistreated by their husbands and they are not in the position to defend themselves. Also, Othello’s easy trust of Iago and distrust of Desdemona can be annoying, but the actors play the scenes so well as to make these situations all the more tragic in their believability. Jones especially does an excellent job of making Othello sympathetic in the end. The scenes between Desdemona and Emilia are also convincing and compelling. This is a tragedy on many levels, as a good man is given over to the “green-eyed monster” and loses his own character in the process, and an evil man is allowed to hold sway in his vile machinations and everyone around them (especially their wives) is made to suffer because of an inexplicable grudge. It’s a timeless tale given new life by its setting and thoroughly convincing portrayals. The production is yet another remarkable success from Shakespeare Festival St. Louis. I can’t wait to see what they come up with next year.